Fiat Lux is Latin for “Let There Be Light”. 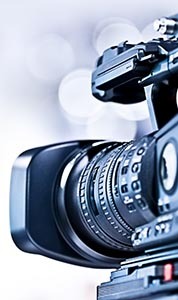 Video production is an exciting and rewarding format that can launch any business into their next phase of income. We can help you achieve that. We take the time to listen to you. Your needs and wants are paramount. We guide you and inform you to make the best video for you on time and on budget. Fiat Lux USA is a video production company that puts the client first and foremost. We have been involved in film and television production for the past 20 years. Having worked for various movie and television shows, Fiat Lux USA has a colorful background. And the experience needed to put together a great video. In addition to the above, we have done various music videos, rock shows, variety shows, and various sporting events. Fiat Lux USA has the experience and know-­‐how to produce the video you want and desire. Concept to creation. Mild to wild. Fiat Lux USA is the video production company for your needs, serving all of Ventura, Santa Barbara and Los Angeles counties. Call Today for a consultation 805.484.1089 or 818.577.8576. Fiat Lux USA Copyright © 2019. All Rights Reserved. Designed by Folded Crane Design.